Yorgos Lanthimos’ ‘The Favourite’ is set to have its world premiere at the Venice International Film Festival. The festival will take place at the Venice Lido from August 29th to September 8th, 2018. 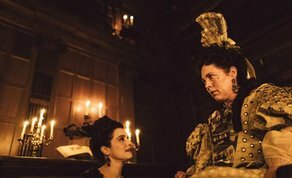 This follows the announcement earlier this week that ‘The Favourite’ will also open the New York Film Festival on September 28th. ‘The Favourite’ stars Olivia Colman and Academy Award winners Rachel Weisz and Emma Stone and marks the third collaboration between Element Pictures and visionary director Lanthimos following award-winning films ‘The Lobster’ and ‘The Killing of a Sacred Deer’. “Venice is the ideal world premiere for Yorgos’ bold and audacious foray into period film making. We hope audiences will embrace this unique and entertaining film and we are delighted to be working with Fox Searchlight on its international release." Fox Searchlight are releasing ‘The Favourite’ worldwide with the US release scheduled for November 23rd.The film will hit Irish cinemas on January 1st. Recent Fox Searchlight releases include last year’s Oscar winners, ‘The Shape of Water’ and ‘Three Billboards Outside Ebbing, Missouri’.